2015 National Voter Registration Day BE READY FOR THE 2016 ELECTIONS! 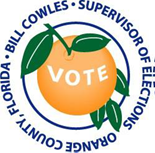 WHO: Orange County Supervisor of Elections – Located at 119 W. Kaley Street, Orlando, FL, 32806. NOTE: Bill Cowles is available for interviews. WHAT: September 22, 2015, is recognized as National Voter Registration Day. The Elections Office will be celebrating by having special voter registration sites throughout the week where citizens can register to vote or an existing registration record. National Voter Registration Month was established in 2002 by the nation’s Secretaries of State, to encourage voter participation and increase awareness of state requirements and deadlines for voting. WHEN: Events will take place from September 21 through September 25th. WHERE: Voter Registrations will be held in various locations around the county, please see next page for details. Individuals may also visit the Elections Office at 119 W. Kaley Street in Orlando. The office can also be reached by calling (407) 836-VOTE (8683) or (407) 836-2070 or by visiting orangecountyvotes.com or ocfelections.com. Mandates voter registration sites will also be available for Voter Registration: all public libraries, Driver’s license Office, WIC & DCF offices and Center for Independent Living.